n this complete musicians guide to Instagram you’ll be given key stats, heaps of top music hashtags for artist, band, and producer promotion, and insane tactics to blow up your Instagram account. To present you with new ways of thinking about growing on Instagram, we have included tips and tools used by influencers, entrepreneurs, and startups. Many of these practices will take up quite a bit of your time and sometimes a little investment. But since you’re embarking on a career in music that requires giving all that it takes, that should come as no surprise and you’re already able and willing. You’re already aware of the power of social media and the fact that it can be a part-time job. By the end of this guide you’ll be understand why the limited time you have for social media should be predominantly focused on Instagram above all other platforms. There are plenty of reasons to believe that Instagram is the platform of the future, especially when it comes to the working creative class. Many will argue that all social media platforms are equally important for artists. The truth is there is no one-size-fits all formula for best distributing your online presence. It is your job to learn where your target audience tend to congregate and serve up the type of content that performs best on those platforms. Reverse engineer the social presence of a successful artist or band that you feel matches your style and has the kind of audience you would like to attract. Where do they have the most followers? What kinds of posts get the most engagement? Research, experiment, and learn. 1 billion monthly active users. Users under the age of 25 spend more than 32 minutes a day on Instagram, on average, while those age 25 and older spend more than 24 minutes a day. 80% of Instagram users live outside the US. Brand engagement rates are 10x higher on Instagram than Facebook. Posts with locations get 79% more engagement. There are 400 million users watching Instagram Stories on a daily basis. Instagram ads (though more expensive than Facebook) perform much better. 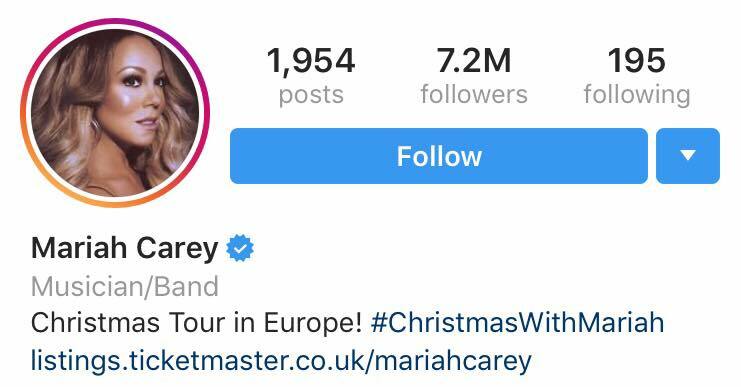 Though young people use Instagram much more, there are still tons of older users who also happen to be very high number of concert attendees. Now let’s look at setting yourself up for success. Music fans often seek out artists they like and wish to follow. This means that you want your Instagram profile to be search friendly and easily discovered. When creating an account, your profile is automatically set to public with an option of going private. Double check to make sure that is the case so you don’t risk publishing your first posts with zero chance of discovery. Your @username (often also called “handle”), is the name of your Instagram profile. You want this to be what you expect your fans would be entering into the search bar to find you. If you’re also using Twitter, be sure to use a matching username. This makes for easier discovery and cross promotion across the two platforms. If you’re already using Instagram for personal use, I’d recommend either turning it into a business profile or creating a separate artist profile entirely. A business profile provides you with Insights about your account and can connect with your Facebook page. You can allow your Instagram posts to be published on Facebook, and run Facebook ads that appear on Instagram that are in relation to your account. Be conscientious that though your fans may want a behind the scenes look at your life, they may get bored of your burritos and lattes. Keep these posts for your personal profile and don’t risk boring your audience. Though you can also have your Instagram posts published on Facebook, that doesn’t always mean that you should. Fans that follow you across platforms may get tired of seeing the same image or video twice. Remember to steer toward posting the kind of content that performs best on each respective platform. To set up a business profile, simply tap on Settings > Set Up Your Business Profile. Once this is done you’ll want to review the details and make sure everything is looking good. Though these images are displayed rather small, you still want to choose something that is on-brand and easily identifiable. If you have a logo or font for your musical project, use that as a profile picture. This will be the first thing visitors read when arriving at your profile. Instagram only permits 150 characters so consider writing something to-the-point that leaves no room in the visitors imagination to think that they’ve arrived at the wrong profile. There is an option in your Instagram settings that allow you to connect other social accounts. This is great, but as mentioned before, you want to be scrupulous with posting the same content across all platforms. This can tire your audience. 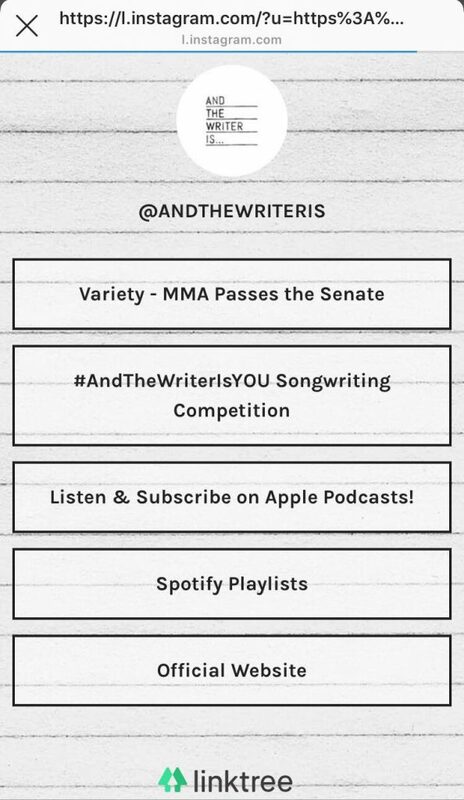 As of this writing, Instagram allows you to connect directly to your profiles with Facebook, Twitter, LinkedIn, Tumblr, Flickr. For other networks, there are possible work arounds with a nifty tool called IFTTT. Instagram allows only one outbound link in a bio. This is to try to keep users on their platform instead of a competitors like YouTube or Soundcloud. To work around this, there is a fantastic free tool called Linktree that inserts a single link in your bio that opens up a window where you can insert unlimited additional links. It tells you how many times each link has been clicked and has a few well-designed themes to choose from. As you can see, Linktree will allow you to send visitors to your website, YouTube, Facebook, Soundcloud, BandCamp, Spotify profile, etc. This is a super useful tool so be sure to set it up. There’s a lot of information bouncing around online about the use of Instagram hashtags. Hashtags are an undeniably powerful way to organically promote your posts. 88% of brand posts include at least one hashtag which can give your post at least 12.6% more engagement. So logically you’d suspect you should just stuff as many relevant hashtags in your posts as possible, right? While Instagram permits users to use up to 30 hashtags per post, such use is regarded as spammy. Experiment with 7-10 relevant hashtags and go through your Insights to determine which are working best. Swap out underperforming ones for new ones and keep testing. Using an Instagram business profile allows you to track the success of the hashtags you use to help you determine which ones are performing best. To do this, simply select on one of your posts, tap “View Insights” where you’ll have an option of viewing which hashtags used generated an impression. Apart from just following specific profiles, users can follow topics that interest them via related hashtags. The type of audience you’re looking to attract to your content will dictate what kinds of hashtags you should to use. You want to choose hashtags that make the most sense for your goals. As a music producer or lyricist, you want to target songwriters and bands. As an audio engineer, you should target music producers and bands. See where I’m going with this? Next you want to consider how many people post under these hashtags. While you may think that the highest amount of posts means that specific hashtag means the most engagement, it typically suggests that specific hashtag would be very hard to rank high for, as the top posts are the ones receiving the most engagement within the first 24 hours. Experiment with this and keep in mind that bigger isn’t always better. Consider creating your own hashtag derived from your artist/band name, an album title, festival name, etc. Be sure to have everyone involved with the project to use it in their related posts and incentivize your followers to use it as well. This is great for creating a buzz and some funny things can subsequently come of it as well. 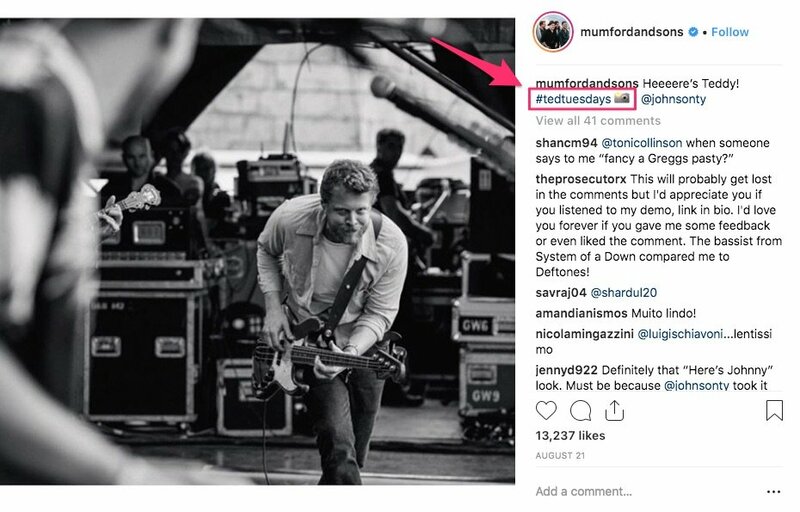 A perfect example of this is from Momford and Sons bassist Ted Dwane who posts regularly on Tuesday and created his own hashtag #tedtuesdays to celebrate the ritual. Many fans now follow the hashtag and his posts get up to 10,000 likes and plenty of comments. Latin popstar Maluma created the popular hashtag #BailandoMalaMia around his single ‘Mala Mia’ which encourages fans to film themselves dancing to the song and post under the hashtag. Maluma picks some of his favourites and shares them on his own account. For sure the winners are gaining tons of followers from the share and Maluma is getting user generated content at no expense or effort of his own. The videos have received millions of views and heaps of engagement for his account. This is the part most of you have been waiting for. A massive list of some trending hashtags to copy-paste to promote your music on Instagram. We have split these up into broad and niche categories so that you can easily find ones that suit your targets. Some of these music hashtags have only a about 10,000 posts and some have millions. As mentioned before, you want to experiment with hashtags with varying amounts of posts. Use the hashtags with the most posts on the content that you suspect would perform the best as that’s what it will take to rank to the top. Once you’ve created a list of relevant music hashtags that suit your goals, categorize them into a few different groups that will better serve the purpose of the individual posts you make. 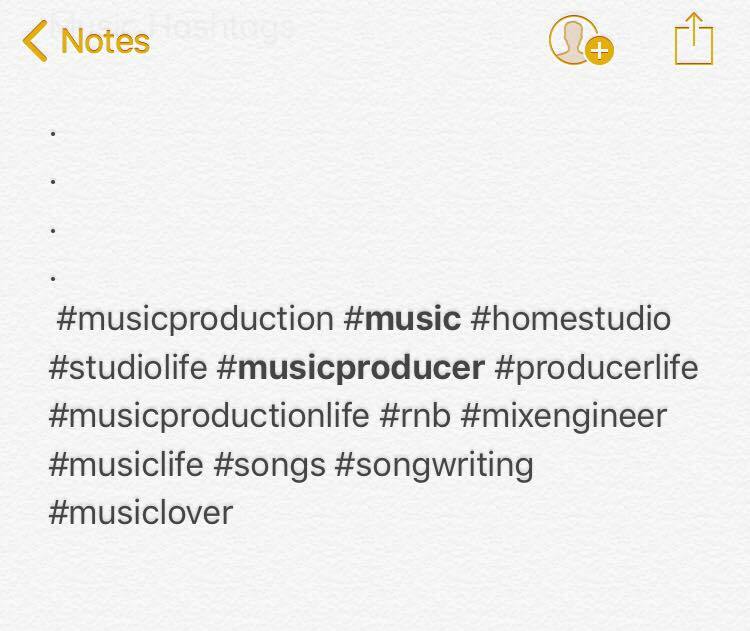 For instance, if you’re an songwriter working in the studio then you’ll want to use some studio related hashtags in the mix. Use concert-related hashtags for live shows, lyric-related hashtags for poems or live bedroom performance, so on and so forth. You’ll need these lists of hashtags stored on your phone for easy access. Your phones stock notepad will do just fine. You only need to copy and paste. That’s right. This means that once you enter them into the caption area and post your content, all of your hashtags are stuffed underneath your image and it looks spammy and unattractive to viewers. You want your fans to see your image or video with your witty caption below and the like button immediately after. Not a stack of hashtags taking up 1/3 of their screen. Copy all the periods along with the hashtags. In Instagram, write the caption for your post and paste this in right after. This way, fans will only see the bulk of your caption with an option to see more. From there, they can choose whether or not to read the remainder of your caption and view your hashtags. This method keeps your feed clean for your followers and should be used every time you’re using a group hashtags. A caption is the description or explanation of your content that may include emojis, hashtags, and tags. Instagram permits 2,200 characters or about 310-340 words give or take. Captions with emojis are known to get higher engagement for posts as long as they are relevant and provide a striking nuance to how the post could be understood. Emojis can introduce and sense of irony, sarcasm, and endless other feelings for how the post can be received. 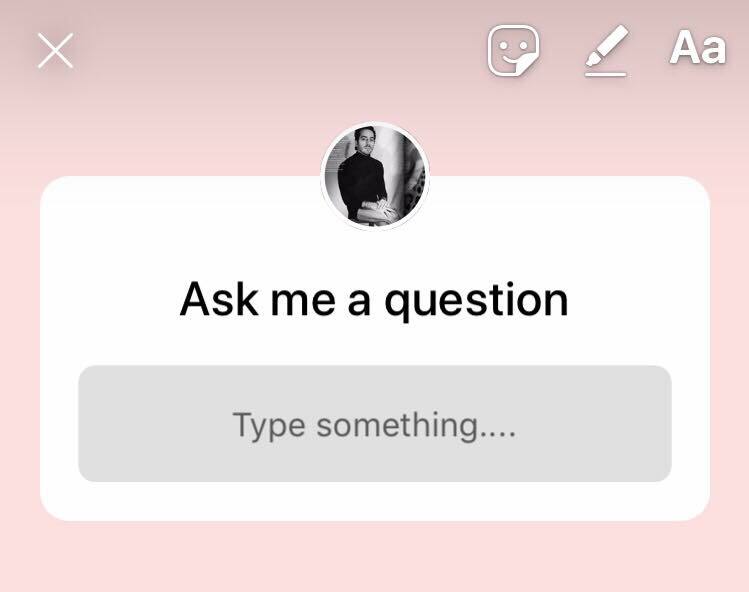 Keep your questions relevant to the content in the post and to the interests of your fanbase. If fans know your lyrics, consider whipping up an image of text reading the first part of a popular lyric. Leaving the resolution of the lyric up in the air, you could encourage fans in the caption to finish the lyric in the comments. See where I’m goin’ with this? 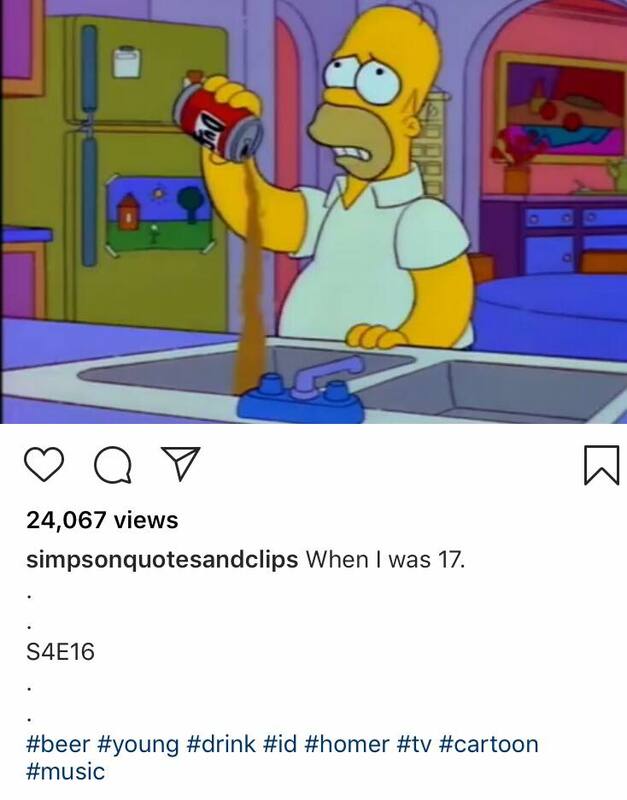 Tags are when you include someone or something else in your post. This can be the music studio, bandmates, tourmates, engineers, designers, label execs, etc. Essentially anybody on Instagram. Make this a habit as it helps get more eyes on your content and cross-pollinate fans and followers. Geotags are when you tag the place or city that your photo is taken in. This is great because many people follow the hashtags of cities and establishment. Should you tag yourself somewhere, you have a chance of being shown for that location and their followers will see your post. Now that you’ve got your hashtags collected and your head wrapped around captions, it’s time to post. Posting sure isn’t rocket surgery but there are a few things to consider. The rate in which you post isn’t as important as consistency. Many Instagrammers who went from posting frequently to less often saw a decrease in impressions and engagement. Posting more often with little to no engagement will signal to Instagram that your followers simply aren’t interested in your content, and they’ll refrain from showing it to them. Frequent posting doesn’t mean more engagement and can be just as problematic as helpful. What matters is your audience and their behaviour. Unless the data suggests your fans are hungry for it, don’t force feed them and risk tiring them out. Look at an artist like Ariana Grande. 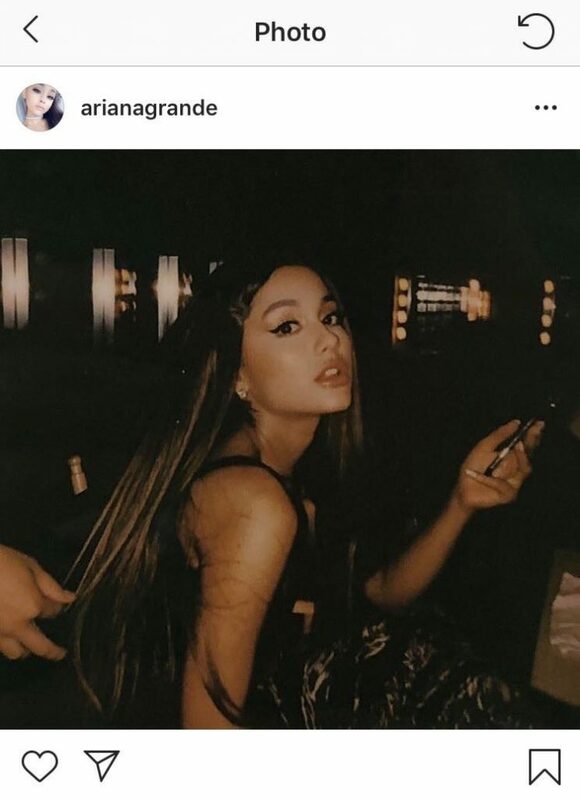 This girl can post 10 times a day or more and receive tons of engagement. She also has a large following of teenagers who spend and average of 9 hours a day on their phones. If this is not your audience, don’t believe that yours would consume as equally as hers. Post great content at a steady pace that is realistic for your lifestyle. If you’re getting great results and want to increase the amount that you post, ask yourself how long you actually think you can keep it up. Shoot for a middle ground, examine your results, and post accordingly. Wednesday 3pm, Thursday 5a + 11am, 3 to 4pm, and Friday at 5am. Thursday is the best day to post. The safest times to post are Tuesday through Friday 9am to 6pm. Sunday is the least engaging day of them all. Try experimenting with these hours and look at your Insights. Stats are great but many experience great success outside of what they suggest so take them with a pinch of salt. Many Instagram influencers use a common colour scheme, font, filter, and other visual strokes of the brush to establish a unified aesthetic across all of their content. When this works it can really pop and can make followers know immediately who’s images they are looking at. Super cool but tough for musicians. Especially those who don’t have a natural eye for design or a common theme among their content. But it’s sure worth trying out and doing so isn’t so hard. 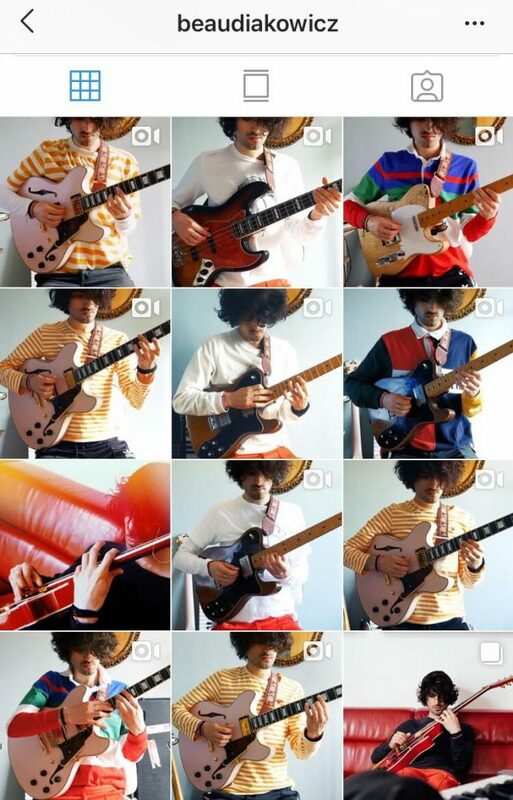 Beau Diakowicz is a an English jazz/soul guitar player who has evolved the theme of his popular live guitar videos and has amassed himself over 85,000 followers. Logos and custom fonts can add a really nice touch of professionalism to an artist or band. They can also be pretty expensive. There are a few tools out there that can help you design a logo on your own and some other reasonable options for getting a professional logo designed by pros. Canva is a free solution that offers some watered down features of Photoshop but has tons of cool templates to work off of and great design features to help you produce and edit your content. Whether you want to tweak images, design visual content, or take a swing at designing a logo, Canva is the best free option around. We use it for content on this very site all the time. You can also use Canva to design branded content. For instance, place a profound lyric over a band photo with a chosen font and the band logo in the corner. Whip up a few of these and have a few new pieces of content for your Instagram feed. Fiverr is a marketplace of freelancers offering a variety of services at an average of five dollars per order. I’ll admit, much of the work is mediocre but you may not need extraordinary work done. Designers can also deliver the work in a variety of formats and sizes to suit your needs so take a quick poke around, you may actually land on someone worth while. 99 Designs is another marketplace of much better graphic designers where you submit the description of what you’re after, your budget, and the caliber of product you’re looking for. A bunch of designers submit you their work and you decide on, and only pay for, your favourite. This can cost a few hundred bucks but the quality is high. Some of the biggest companies and startups use 99 Designs all the time for design work. Videos perform really well on Instagram and are really fun to produce. A recent study from Newswhip showed that some of the largest publishers saw an average of 33% engagement on videos and 67% on photos. 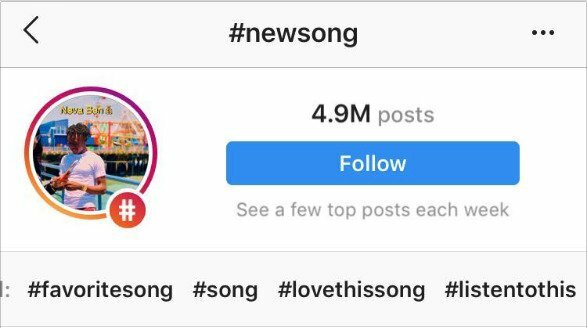 Instagram allows videos of up to 60 seconds in length which is more than enough time to share a message or a substantial piece of a song in progress. To compete with Snapchat, Instagram has expanded their video features so much to have nearly wiped out their competitor and provide advertisers like yourself tons of great reasons to market on their platform. If you’re already on Instagram then you already know what Stories are all about. Here we’re gonna dive into some essential details to help you think about Stories in ways that can be useful for successfully promoting your music on Instagram. In short, Stories are 15 second long photo or video posts that expire in 24 hours. These posts appear in a small circle at the top of your followers account where they have the option of viewing the story or not. 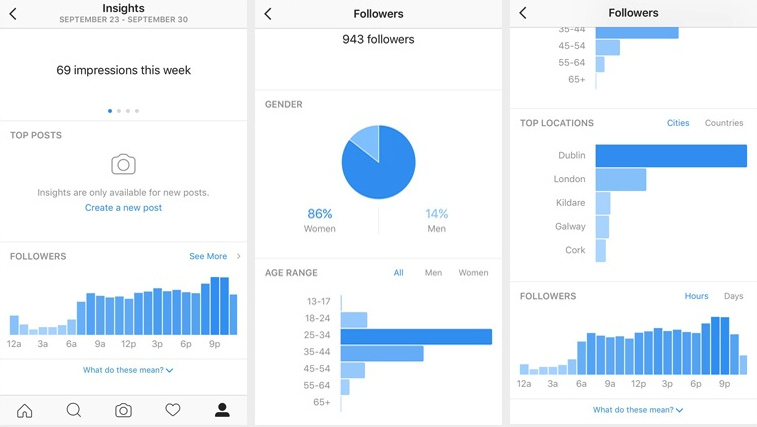 Instagram Stories lets you see who has seen your post while Insights provides you with data about their engagement. For those considering posting more frequently, this is a good way to test the waters and see if your audience cares enough about your content to justify the efforts. The ultimate feature that can benefit musicians is the addition of a link in your story. Instructing the audience to swipe up will send them to your link where you can promote a new release, a music video, merch, a blog post, etc. 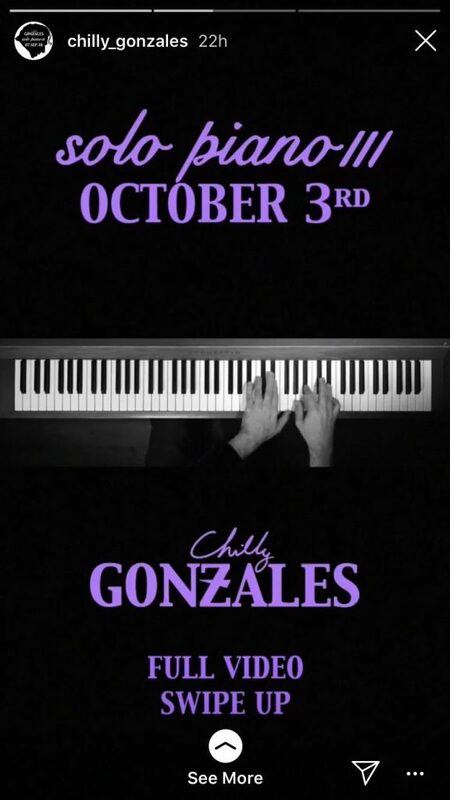 Below is an example from pianist Chilly Gonzalez who’s sending his followers to a full length video on YouTube. 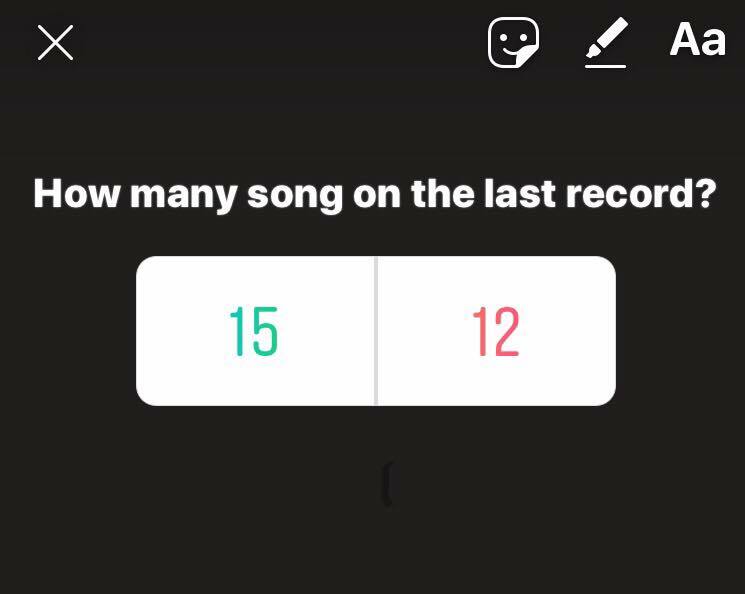 The next best features of Instagram Stories are the rather self-explanatory questions and polls. I’m sure by now your buzzing creativity is having babies over the potential ways you can encourage your fans to engage with these features, but if not, here are some ideas to get the ball rolling. Insert two images of new sketches for band t-shirts or album covers and poll them to discover their favourite. Ask them who’s the hottest hunk in your boyband. Ask them who to feature on your next single. Create questions that data mine for insights on your followers likes, interests, and habits. Hint at or subtly promote upcoming events, releases, or collaborations. The best thing about stories is they allow you to stay in the periphery of your audience and give your avid followers a behind the scenes look into your life without pushing it on them through regular posts. Those who wish to engage do, those who don’t, don’t. Plain and simple. All the same rules apply to Stories as they do with regular posts. Hashtags, tags, and geotags function as you’d expect and help expand the reach of your story so be sure to use them. 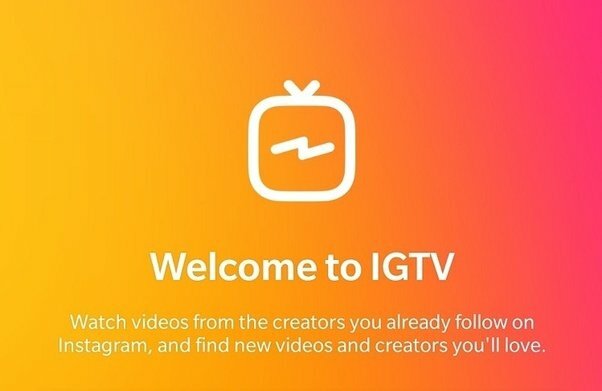 IGTV is Instagrams first big attempt at taking on YouTube. While it’s doubtful that it could replace YouTube entirely, it can definitely compliment it. As of this writing, Instagram is encouraging users to post long-form video of up to 10 minutes for most accounts and 1 hour for larger ones. One major turn off is that videos on IGTV are all vertical, putting quite a restriction on the types of videos you can publish. Nonetheless, it’s a great way to entertain your audience where they’re sure to already be hanging out: Instagram. For the time being, IGTV is free from any advertising. The good part about that is your videos play uninterrupted and increase the chances of your fans staying tuned in longer. The downside to that is you will not be able to create ads promoting your music that will be seen on IGTV. This is undoubtedly temporary and is merely a way to attract people into producing content for IGTV and create a habit for users where eventual advertising won’t be enough to break the habit altogether. Remember, Facebook was, at one time, ad free. IGTV is easy enough to set up, provides publishers with all the same analytics as posts and Stories, and uses the same practices for hashtags, tags, geotags, and links. It may be early in the game but that is often the best time to get started. Facebook will surely develop the feature over time do everything they can to keep people on their platforms. If you’ve got a backlog of entertaining, behind-the-scenes videos on your phone, repurpose them into a collage of videos for your fans and keep experimenting. Instagram Live is a live streaming feature that lets followers tune in in real time. This is great for live performances, rehearsals, backstage hangs, studio sessions, etc. It is important to keep in mind how much we all hate watching shaky, nausea-inducing videos. To help you all produce worth-while video content, we put together the Ultimate Guide to iPhone Filmmaking which includes many of the best lenses, stabilizers, tripods, tools and tricks to get the most out of your iPhone video footage. After your live stream, the video is deleted forever. This means your stream is a one-time-only video which adds a degree of novelty and excitement for fans. Be sure to keep it entertaining and personal to give fans an exclusive experience only they can get. The big question on everyones mind. Getting followers on Instagram is hard work and if you’re not already a public figure than it can easily be a part-time job. Many well-known techniques soon become outdated as Instagram updates their algorithms so chasing the puck becomes exhaustingly time consuming. Many have been seduced by the idea of buying followers or using bots. These techniques are are useless as Instagram caught on really quick that people were trying to rig the algorithms. There are now even tools to learn the legitimacy of a profiles followers. The point is to have an engaged audience that interacts with your content which signals to Instagram that your content is worthwhile and worthy of being displayed to followers. Below are a few kosher tactics to grow your Instagram account. Be prepared to dedicate time to the process and play the long game for the win. Engagement groups are essentially group conversations within and outside of Instagram of users in a given niche. Members of these groups participate in liking and commenting on other members posts in exchange for the same treatment on their own. These groups are a bit of a hot topic with many people on both sides of the argument debating over their effectiveness. Some argue that likes and comments from these groups are less valuable than organic engagement and that Instagrams algorithms are smart enough to know when this kind of activity is taking place. Whether or not the existence of engagement groups is an indication that they are effective seems to be up in the air. To join engagement groups, the common tactic is to direct message similar profiles and ask them if they are a part of a group. If so, the member will assess your profile and determine whether or not your style of content would be beneficial for the group and if it could perpetuate the tide that help rises all the boats. Some engagement groups require an upfront fee so be sure to assess the legitimacy of the profiles you examine as to avoid any scammers. Contests are a great way to get engagement and and make fans feel like they’re participating in your success. You can offer up merch, exclusive content, virtual hangs with fans, tickets to shows, meet and greets, and more. Integrate contests with features like polling and voting which makes things interactive for fans. Contests are easy to create with tools like Wishpond, Gleam, and Woobox. They all have several pricing tiers that offer a variety of features to pick from to best suit your competition. The cost for running competitions is quite low when you take into account the amount of engagement, shares, and comments you can acquire to your profile. If you’re on tour, you could offer up a pair of tickets for each date to lucky winners who have shared your post. Since your post will be shared by tons of people, you’ll want to make it immediately engaging with a sound bite of your latest single so everyone your music. Contests can also be run from your website and marketed on other platforms. Gleam allows you to create contests where fans enter by performing actions such as liking and following your various social accounts. Each action is attributed a value and fans who perform the most high number actions get a higher chance of winning the prize. Here’s an example from one of our favourite online music production schools Puremix.net where they are gaining more followers across all their accounts by offering a lifetime subscription to Kush Audio products. You can tailor the actions and the values you attribute to them to suit the platforms you’re looking to promote. This is a perfect 2 birds with one stone trick that can get eyeballs on all the various forms of content you’ll be putting out. Instagram influencers are not only half naked individuals or world travellers who work full time on building a following on Instagram, but also niches that focus on a topic or theme. Brands pay big money to have their products shown on these large accounts and that certainly is one way to go about it. You don’t have that kind of F-U money to throw around so there must be no chance in hell of getting your music shared by an influencer, right? Wrong. This video by influencer crew High On Life breaks down a very tedious but tremendously effective way of building an fresh influencer page and gaining 100k followers in 48 hours. Your not going to build an influencer page but your going to use this technique to mashup existing content featuring your music for Instagram influencers. You just wrapped up your latest booty clappin’ hip hop single. Instagram is loaded with girls publishing their booties to their tens of thousands of followers. There are also accounts that collect these videos of a wide range of girls, publish them, and credit the girls in the video. Go find these these girls and these accounts and make a long list. You want to shoot for growing profiles of a few thousand to 30k instead of massive ones as they are likely harder to break into. Download a collection of their videos and creatively edit them to your new single. They only need to be 15-30 seconds long. Make it a full time job for a week and create 100+ of them. Once you get on a flow, you’ll crank them out much faster and develop a process for creating them. Don’t ask for anything in return except the option of tagging you. You want the influencer to feel that they gain a new piece of fresh content their audience will love without any effort or the expectation for reciprocity. Not all the accounts will publish them, and some may require a small fee. But if only a few of them do, and those accounts have thousands of followers, those followers will all hear your music and can visit your account from there. There are tons of niches this is relevant to and it is certainly not restricted to booty clappin’. Did you just write a song about having a child? Look for accounts focused on motherhood, parenting, cute baby videos, and pregnancy and follow the same process for your new song. Hell, your music may perfectly suit a montage for accounts in sports, country lifestyle, or even pottery. This is certainly a time-consuming technique but the hours you dedicate to pumping out mini videos for influencers can exponentially grow your account and get in front of potential fans wherever they’re hanging out on Instagram. So now you’ve got your head wrapped around all the features of Instagram, a powerful list of top music hashtags, and a few techniques to build your fan base. Again, Instagram can be a part time job. But you know it’s worth it because you’ve read this humongous article in its entirety and are ready to successfully promote your music with it. If there are any great techniques you’ve come across to promote your music on Instagram that is not mentioned in this article, or you we left an important stone unturned, please write it in the comments below. We’d love to take a look and help out other readers as well.